My kids love pork ribs, and since they are inexpensive, we love them too. Pork ribs can handle a lot of flavor so I wanted to find a way to really "jazz them up". I came up with this recipe today and it was a real hit! It went very well with coleslaw, and had I had time, I would have made a pot of collard greens and Teri's onion torte (to stand in for biscuits) as well. Put the onion slices on the bottom of a large dutch oven or large oven-proof pan with a lid. Place the meat on top, and put the lemon slices and garlic around the meat. Liberally sprinkle salt and pepper on both sides of the meat. Throw in the bay leaf and the star anise. In a bowl, mix the fat with the remaining ingredients, just enough to blend- it can still be chunky. If you can have tomato, I'd add at least 1 cup of tomato sauce or several T of tomato paste at this point. If you like your food strongly flavored, you may want to go a bit heavy on the spices. Spoon the mixture over the meat and and spread it around. Do not add extra liquid- plenty of liquid will cook out of the meat, onion, and lemon. Cook on low for 3 hours. Adjust seasonings before serving. 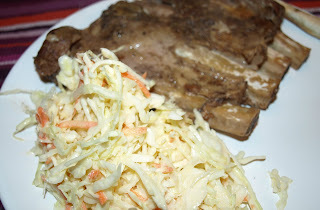 This dish goes very well with cole slaw. Love this blog! My family is on full GAPS diet. I am planning to make this recipe. When you say to cook on low for 3 hrs, do you mean in a slow cooker or in the oven? If in the oven, what temp? Thanks! I cook this in a dutch oven on my stove, but I think a slow cooker would work well or it could be baked in the oven in a covered dish. My guess would be around 300 degrees in the oven?